High resolution images confirm the Beagle-2 Mars probe landed successfully, quashing speculation that the probe broke apart on impact. 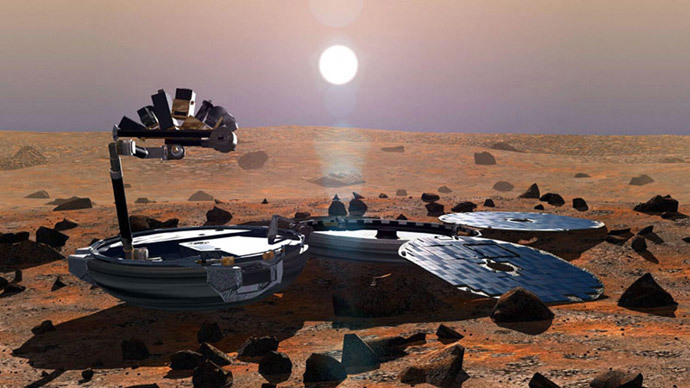 Beagle-2 tried to land on Mars on Christmas Day 2003, but no radio signal was received confirming touchdown. Scientists assumed it had broken apart during landing, but have since discovered the probe failed to deploy all of its solar panels and so couldn’t transmit a radio signal. Beagle 2 was sent to Mars in search of past or present life. Hitching a ride with the European Space Agency’s Mars Express Orbiter, it was released for landing on December 19, 2003. The Mars lander was meant to open a parachute on its descent to the planet’s surface and inflate airbags to cushion its impact. Satellite images from the highly-detailed HiRise camera on NASA’s Mars Reconnaissance Orbiter have confirmed that parachutes were opened as expected, proving the landing was a success. “The history of space exploration is marked by both success and failure,” said David Parker, CEO of the UK Space Agency. Mark Sims, who was the Beagle-2 mission manager, said he was “delighted” the probe had been found. “Every Christmas Day since 2003 I have wondered what happened to Beagle-2,” he said. “My Christmas day in 2003 alongside many others who worked on Beagle-2 was ruined by the disappointment of not receiving data from the surface of Mars,” he said. Sims said the satellite images “vindicate the hard work” put into the project. “The images show that we came so close to achieving the goal of science on Mars,” he said. Unfortunately, the discovery comes too late for one key scientist on the team. Colin Pillinger, who was the driving force behind the Beagle-2 mission, died last year. In 2005, he claimed that images of Mars’ surface taken by NASA’s Mars Global Surveyor may have shown a glimpse of Beagle-2. He believed the probe may have hit the ground too hard, as a result of a thinner-than-expected atmosphere following a Martian dust storm. He said the images suggested Beagle-2 came to rest in a crater closed to the planned landing site. A truly British mission, Beagle-2 even enlisted the help of artist Damien Hirst, who painted the probe’s “test card” to calibrate its cameras and spectrometer instruments after landing.